If you’re clear and concise in your document, does your small business really need to have a lawyer review your employee handbook or contracts? A recent court decision has shown us just how important the details can be when drafting an employee document. A dairy in Portland, Maine may be liable for $10M in overtime pay to drivers—because they didn’t use a serial comma. 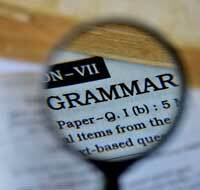 A serial comma, or Oxford comma, is the comma that appears before the conjunction in a series. In some style guides, it is optional. For example, in the phrase “apples, oranges, and pears” the comma after “oranges” is not required and is often omitted. But in some cases, that comma can add crucial clarification—and save you a lengthy court case. This clause details which actions are exempt from overtime pay. Buy not putting a comma after “shipment,” the phrase could be interpreted as “packing for [either] shipment or distribution” or could indicate two separate tasks, “packing for shipment” or “distribution” (which is what the drivers did). Since the comma was not used to clarify that distribution was the task—not packing for distribution—the court found that the drivers’ work was not exempt from overtime pay. Saving one comma will cost the company dearly. One lesson to be learned from this case is to use all the grammar tools available to make your documents as clear as possible. Proofreading is essential—but having a legal professional review your documents is a good idea.